So...this is coming out for PS3? If it came out for Ps2 it'd make my year but I haven't heard anything about that unfortunately. I don't really think PS2 could hold Tekken 6. Besides, you aren't going to push your system if you keep releasing titles on PS2 as well. That would be bad marketing. ok what happend is that Kazaua and Heihachi never entered the tournament, Jin won and now is the owner of mishmia Zaibatsu and now the world is at war thanks to Jin. G cropration now runed by Kazaua, is the only people who stand in Jin's way of world domnation. G.Cropation has offered a award for bringin in jin. that's all I have at the moment, but as some of you know it is ture Yoshi is lossing his power. Here is a loose translation of Yoshi's story translated by I believe Ogre Killer. Seems to confirm the two sword thing. In order to attack the enemy of the companion, as for the good fortune light which chases [buraian] fury, &#22934; sword good fortune light does trouble &#12293; quickly and becomes aware in having increased. As for &#22934; sword good fortune light literal &#22934; sword. It is the sword which spurs the person who seeks the blood always, has to insanity. So far, good fortune light held down the reckless driving of the &#22934; sword by the fact that the bad guy who has wicked mind is cut, but the balance was deteriorating recently. This way it seeks the landlord where the &#22934; sword is new and is not unable to drive recklessly. So because the good fortune light which is felt by the fact that the seal demon sword which has the power which seals the power of the &#22934; sword is designated as the hand, temporary as the worst situation, reckless driving is evaded, in order to reset the power of the &#22934; sword normally, participates in The King of Iron Fist Tournament 6 where wicked power meets it was. So saying it normaly, Yoshis sword is the one from SC (from what I understand) and because of the thril for vengence, the evil consumed from soul edge by the sword is starting to awake, since Yoshi's anger fed this "evil" or that Devil Jin has awakened it, so in order to not go out of control he uses other swords or what? (My god how auto trnslations are hard to read). Here is what most of you have probably been waiting for... Yoshimitsu's new look! I expected Namco to come with something better... Tekken 5 costume is not my fave. Why not doing something Tekken2 or 3 alike? Tenshimitsu : I expected Namco to come with something better... Tekken 5 costume is not my fave. Why not doing something Tekken2 or 3 alike? He seems to be going more robot every game. I think this newest one looks plain badass. I wouldn't want to mess with him now. Is this tekken or Robot wars? Seriously, first the new Jack is a transormer, now Yoshi looks like taken from a transformer spin off called Beast Wars (ahh the young days...back to the present). I know the Japanese are over the top with robots and mechs, but jeez. Naw, those are from the latest Arcadia magazine. 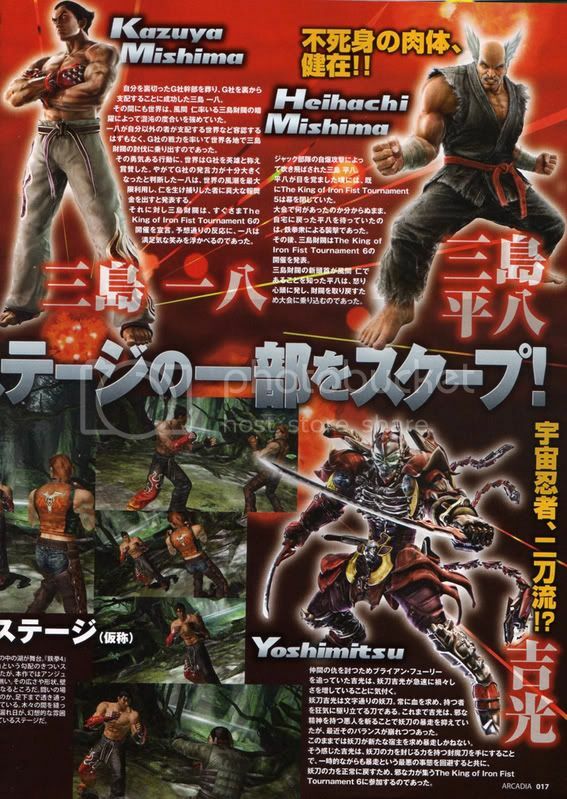 They have those screens plus profiles for Heihachi, Kazuya, Yoshimitsu, Leo, and Zafina. Heh, Yoshi looks as if he'd be as pissed off as a squirrel with a frozen peanut and broken teeth. And his costumes get darker with every Tekken. Good news for me, I sort of like the semi-gothic image I have of him. And Boss is right, Hei and Kaz could use a a new look. Let's send Hei to "10 Years Younger" and Kaz to "Super X-Treme Makeover". And by the looks of it, the younger generation follows the older's example; Jin and Hwoarang look the same as always, too. By the by, has anyone ever read/seen "Spawn"? Yoshi's mask reminds me of his face.